From its inception to the Second Industrial Revolution, the practice of preparing and serving chocolate can be defined by two essential qualities: the impression of luxury, and cookware designed to reflect the labor required to produce it. Throughout its history, methods of preparing and serving chocolate have changed along with the culture around its consumption, as chocolate moved from connoting wealth and power amongst Mesoamerican indigenous cultures, to serving as a social vehicle for the 17th century Western elite (Martin and Sampeck 39-43; Righthand). 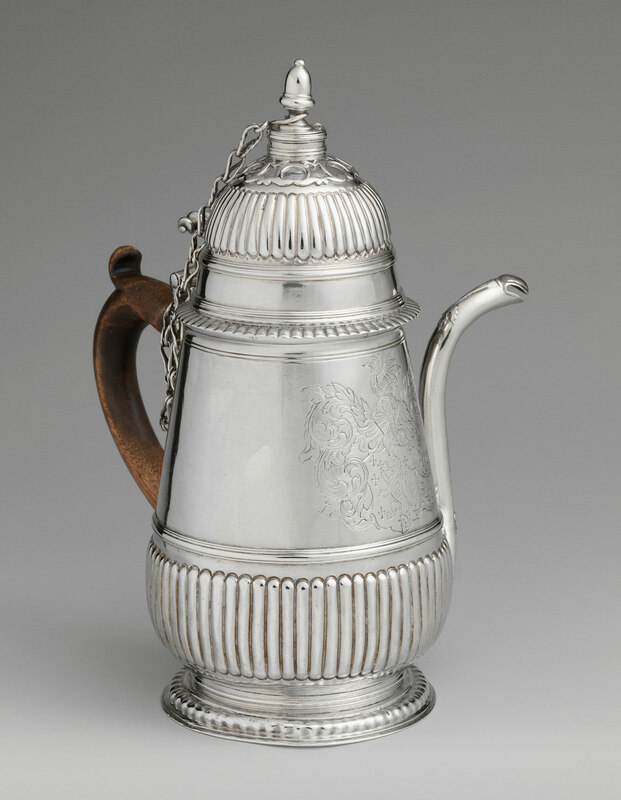 In each case, chocolate was a symbol of status, and the vessels used to store, cook, and serve it reflected that symbolism. From earthen vessels and molinillos to matching ceramic chocolate sets, the various methods of storing and serving chocolate in Aztec Mexico, seventeenth-century Europe, and post-Industrial Revolution America reveal the changing ways that chocolate’s status as a luxury item was entrenched visually as well as economically. Cacao’s status as a food of the elite originated in the culture behind its production and consumption in Mesoamerican tradition; in this case, the manual labor required to make chocolate drove its elite status – labor symbolized by the instruments used to prepare and store it (Coe 220). The cacao tree, or Theobroma cacao, is native to Mesoamerica and was adopted by the Olmecs, the Maya, and eventually the Aztec as a currency, spice, dietary staple, and most importantly as the primary ingredient in chocolate, a drink featuring spices such as vanilla and ear flower which served as a beverage of warriors amongst the Aztec (Coe 181-220, 1274). Chocolate was associated with the display of wealth and power; because cacao is a fickle fruit, requiring significant labor to grow and then process for consumption, restricting chocolate to those in positions of power – noblemen and warriors – was a testament of the power and social clout of the drinker (Coe 220, 1088). The physical embodiment of that clout were the vessels used to store and prepare cacao and chocolate. The Aztec king Motecuhzoma the Younger stored over 960 million beans in large, guarded bins coated with clay, and two thousand containers of chocolate daily were transported for consumption by his guard (Coe 1182-1194). Additionally, the preparation of cacao required an tool known as the molinillo, or chocolate mill, a slender, curved stick with a knob at one end, used to froth the cacao before drinking. Building and using molinillos required significant skilled and artisanal labor, as can be seen here (constructing the molinillo) and here (using the molinillo to froth chocolate), which depict the modern incarnation of the tool (Lange 131). To the Aztecs, the higher the amount of froth in the drink – and the more work performed with the molinillo – the greater the quality of the chocolate; this froth was highly prized and even consumed independent of the chocolate drink (Coe 1195, 655). Because of the labor it represented, the molinillo thus served as a cultural, culinary, and anthropological vehicle for enhancing the impression of luxury and labor which chocolate cultivated through its place of honor in Aztec culture. Chocolate was appropriated into European culture relatively quickly after its discovery during the Columbian exchange, and its luxury status was defined by the wealth and social connections required to procure chocolate – wealth then represented by the wares used to serve and prepare it. 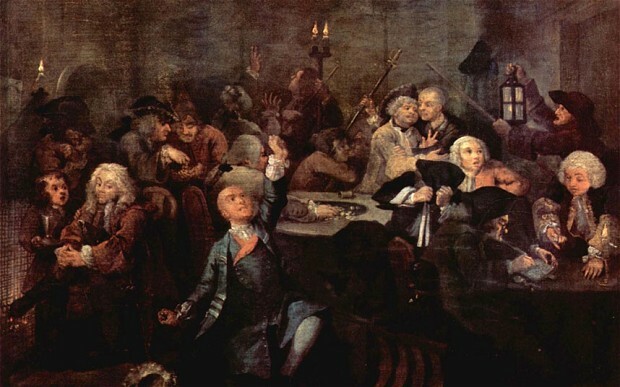 As the Spanish encomienda system ensured that cacao was available to the European elite, chocolate became renowned as a foreign curiosity, a medicinal stimulant, and a luxurious indulgence all at once; drinking chocolate became a public social endeavor representative of class and wealth (Martin 40-41). For example, it was introduced to the court of Versailles at the wedding of King Louis XIII, and throughout the seventeenth and eighteenth centuries, the French monarchy cultivated a reputation both for opulence and a love of chocolate (Chateau de Versailles). Their influence popularized the French chocolatiere set, captured in this painting of the Pentheviere ducal family (PBS Learning Media). As pictured in the painting, such sets were made of ceramic, porcelain, and precious metals, a clear use of wealthy containers to augment the status of the drink they contained (Martin 42; Lange 132). Such sets were outsourced throughout Europe, as far as colonial America, where they were happily put to use by people such as Thomas Jefferson (Lange 133). Interestingly, while the design of European chocolate vessels were Mesoamerican in nature, including tall spouted pots, steep-sided cups, and molinillos, the materials used were distinctly and ultimately representative of a Westernized ideal of monetary wealth. After the second Industrial Revolution, and with it several innovations in the processing of cacao, chocolate became readily available to the public; “vessels” for holding chocolate were replaced by branded wrapping and packaging that ultimately represented chocolate’s universal appeal and accessibility. The invention of the hydraulic press, along with van Houten’s method of alkalizing cocoa, made chocolate more shelf-stable, cheaper, and thus more accessible to the working class (Lange 138). Higher demand drove chocolate companies such as Hershey to homogenize and brand their products through standardized processing methods, as a means of promoting these brands to the working class public (Counihan and Esterik 84-85; D’Antonio 106-109). In this case, chocolate’s value was indicated by size and complexity – for example, Milky Way bars were filled with nougat and caramel, making them larger than pure chocolate bars and thus of greater value, despite actually being cheaper to produce (Brenner 54-55). Yet, like many other once-luxury items such as tea and sugar, chocolate had become a product for the masses, not one for the elite, and chocolate producers deliberately designed their marketing and packaging of chocolate to reflect this shift (Counihan and Esterik 84-85). The loss of elaborate, personalized tools for making and consuming chocolate paralleled this transition of chocolate in the Western cultural psyche – the iconic, cheap packaging of Hershey’s and Mars candy bars indicated that chocolate was no longer a food of the elite, but rather accessible to the average, working class family. The role of chocolate in global culture has changed vastly from its origins as a bitter, frothy drink of the May and Aztec elite, and the way that chocolate is stored, prepared, served, and distributed has changed in tandem. When chocolate was an item of luxury, reflected by the labor required to produce it or the wealth needed to procure it, in Aztec and seventeenth-century Europe, respectively, carefully designed and expensively produced containers and preparatory cookware developed to suit and complement chocolate’s coveted societal place. However, with the advent of new processing methods, and an economic shift towards mass production for the working-class, chocolate’s packing and distribution has changed to give it the impression of universality, and to render it a symbol of the quotidian, in a branded, neat, and instantly recognizable package. Brenner, Joël Glenn. The Emperors of Chocolate : inside the Secret World of Hershey and Mars. 1st ed., Random House, 1999. Carole Counihan, and Penny Van Esterik. Food and Culture: A Reader. Taylor and Francis, 2012. Charpentier, Jean Baptiste. The Penthievre Family or The Cup of Chocolate, 1768. PBS Learning Media, 2018, https://www.pbslearningmedia.org/resource/xir101763fre/the-penthievre-family-or-the-cup-of-choc-xir101763-fre/. Coe, S. (2013). The true history of chocolate (3rd ed.). London: Thames & Hudson. Kindle edition. “¿Cómo sacar espuma al chocolate caliente? Secreto de Cocina, Yuri de Gortari.” YouTube, uploaded by Cocina Identidad, 8 April 2014, https://www.youtube.com/watch?v=PgObquFVkhM. D’Antonio, Michael. Hershey : Milton S. Hershey’s Extraordinary Life of Wealth, Empire, and Utopian Dreams. Simon & Schuster, 2006. “Hot Chocolate in Versailles.” Chateau de Versailles, 2019, http://en.chateauversailles.fr/discover/history/key-dates/hot-chocolate-versailles. Lange, Amanda, and Grivetti, Louis Evan. “Chocolate Preparation and Serving Vessels in Early North America.” Chocolate, John Wiley & Sons, Inc., Hoboken, NJ, USA, 2008, pp. 129–142. “MOLINILLO TRADICIONAL.” YouTube, uploaded by Cocinando con Rita, 28 June 2017, https://www.youtube.com/watch?v=wV78m1W4K2I. colate changed as years went on. Hybridization from Mexico to Europe and beyond brought about a new era for chocolate consumption. One thing that remained consistent, though, was the use of this tool in the actual process of making and frothing the chocolate drinks. Historically, the molinillo has evolved overtime, as one would certainly expect. It was already used for frothing in Mesoamerica and had existed there for quite some time before eventually being adopted by the Europeans; this adaptation will be discussed more below. In today’s world, we see “modernized versions” of the molinillo in frothing machines and metal and automated whisks. Pictured below are examples of the “modern molinillo”. The idea behind it is that these items are used to achieve the same results that the molinillo did for the Mesoamericans and Europeans during the drink-making process (i.e. creating the froth). Taking a look at the original molinillo is a good place to start when thinking about its history. The physical aspects of the object are key to its use. Originally made of wood, the molinillo featured a long handle with a ball-like attachment on one end. Traditional molinillos, like the one shown below, were quite simple in design and creativeness. Once adopted by the Europeans, they became much more colorful, detailed, and varied in shape and size. Click here to see an example of a molinillo that can be purchased today. The Mayans and Aztecs consumed cacao in the form of cold chocolate drinks that were prepared using items such as corn and vanilla (Martin, Mesoamerica and the Food of the Gods). The Mayans and Aztecs rarely added any sweetener to their chocolate drinks (Garthwaite, “What We Know About the Earliest History of Chocolate”). Once adopted by the Europeans, these chocolate drinks became sweet through the addition of milk and other sweeteners such as sugar. The purpose of adding such ingredients was to counteract what the Europeans saw as “the bitter taste of chocolate” (Mintz). Adding these sweeteners made the consumption of chocolate drinks very popular in European countries and the appeal to new consumers was high (Mintz). To add to the idea of hybridization, the molinillo in itself is a very accurate presentation of the many things that Europeans adopted many years back. Over time, chocolate drinks evolved into a form of consumption by those who were privileged with money and considered high class; basically, if you were able to consume chocolate drinks, it was because you were wealthy (Martin, Chocolate Expansion). Seen below is an example of a chocolate house, a traditional European gathering place for consumption of chocolate drinks. The Europeans took aspects of chocolate drink-making and the tools used for this process and changed it to their liking so they could benefit from it accordingly. The tale is similar to any other hybridization and adaption of “colonial ideas” to modern day. Today, we continue to use a modernized form of the molinillo. The tools and machines used to froth milk and drinks of the like are just as important to the creation process as the molinillo was so many years ago. The process itself is, of course, different as technology continues to evolve. However, the act of actually frothing the beverage has stayed the same and that consistency has always been present. The molinillo itself is still used in Mexico and around the world – proving that the innovation and use of the instrument has evolved but has also stayed just as essential to the chocolate drink-making process. When we study artifacts like the molinillo, we can see how hybridization was, and still is, such a relevant process today. Understanding that this tool is important to the history of chocolate is essential to really grasping how chocolate has evolved from Mesoamerican culture to present day. Physically, the molinillo represented and still continues to represent a very important a part of that Mesoamerican culture that evolved to our present day society. It wasn’t just used as a simple tool for drink-making; it was a piece of art that had a purpose and meaning to the Mayans and Aztecs. If I had to draw my own conclusions on the matter, I would say that without the molinillo evolving from what it was in Mesoamerican culture to what it is today in the world that we live in, the frothing process that we are currently familiar with could certainly be different. The evolving of the chocolate drink itself could also be different. Because the molinillo is still used commonly throughout Mexico and even around the world, we have evidence that this object has gone through years of innovation and the idea of “crossing cultural borders”. When we look into artifacts like the molinillo, and others traditionally used by the Mesoamericans, we get great insight into hybridization and how it still has an influence today. Coe, Sophie D., and Michael D. Coe. The True History of Chocolate. Thames and Hudson, 2013. Print. Garthwaite, Josie. “What We Know About the Earliest History of Chocolate”. Smithsonian Institution, 12 Feb. 2015. http://www.smithsonianmag.com/history/archaeology-chocolate-180954243/. Martin, Carla. “Chocolate Expansion”. Harvard University, AAAS E-119. Cambridge, MA. Lecture. Martin, Carla. “Mesoamerica and the Food of the Gods”. Harvard University, AAAS E-119. Cambridge, MA. Lecture. Presilla, Maricel E. The New Taste of Chocolate: A Cultural and Natural History of Cacao with Recipes. Ten Speed Press, 2009. Print. The hybridization of chocolate in Europe was important in defining and distinguishing Old World chocolate from New World chocolate. New ingredients, such a sugar and cinnamon, along with new containers for chocolate are the foundation of this hybridization era. However, while these new ingredients and containers define hybridization, the molinillo, a type of wooden whisk introduced by Spanish colonists to froth chocolate, pictured below, is generally left out of this definition. More so than simply being left out by historians, the molinillo is often incorrectly attributed to being part of the ancient Aztec or Maya process for preparing chocolate. While the molinillo fits a basic definition of hybridization as being a) related to chocolate and b) introduced by Europeans, the molinillo was likely rejected from the European idea of hybridization because it was heavily adopted not only in Europe but also in the New World. If this is the case, then the more formal definition of hybridization is a) relating to chocolate, b) introduced by Europeans, and c) exclusively used by Europeans. Before the molinillo was introduced, the Aztec and Maya made chocolate by pouring the liquid from one vessel to another. Colonial dictionaries regarding the Mayan languages have words like yom cacao, meaning “chocolate foam”, or t’oh haa, meaning “to pour chocolate water from one vessel into another from a height” (Coe and Coe 48). Generally, the greater the height between the two vessels, the easier it was to raise the froth. The Aztec and Maya both believed that the froth was the most desirable part of the drink and put much effort into raising this froth. These ancient chocolate drinkers did have stirrers or spoons to help with chocolate production, but there is no mention of a tool with such a specific purpose as the molinillo (Coe and Coe 85). While the molinillo would have certainly been useful for the Aztec and Maya, it did not exist in pre-Conquest Mesoamerica. It is unclear when exactly Spanish colonists introduced the molinillo. The idea that the molinillo was introduced during the 16th century stems from careful deductive reasoning. As explored, there is no indication that the molinillo existed during the time of Aztec or Maya. Similarly, no word for molinillo appears in the first Nahuatl-Spanish dictionary which was published in 1571; however, a report published in 1780 by Jesuit Francesco Saver Clavier on native Mexican life and history heavily cites the molinillo as a tool for chocolate production (Coe and Coe 85). In this same extensive report, there is no mention of the Aztec and Maya technique of pouring chocolate from one vessel to another. This suggests that sometime between 1571 and 1780, the molinillo was introduced and quickly replaced the traditional Aztec and Maya process for producing the chocolate froth. Given that this timing lines up well with the end of the Spanish Conquest, it is inferred, and widely accepted, that Spanish colonists introduced the molinillo in the 16th century. Besides inventing the molinillo, Europeans created new containers for making and serving chocolate. As Europeans discovered, covering the pot of chocolate with a lid while using the molinillo could produce even more froth. This new invention required a hole in the middle of the lid for the essential molinillo (Coe and Coe 158). These new lids were generally made out of wood, but it later became customary to use a more elegant pot for table service with nobility (Presilla 32). The introduction of the chocolatiére in France, shown below, was often made out of gold or silver and was able to hold the handle of the wooden molinillo (Coe and Coe 158). Unlike the molinillo, these pots are regarded as a part of hybridization, likely because they remained in Europe and were not heavily used in the New World. French chocolatiére, note the hole at the top for the molinillo. Besides introducing the molinillo and creating containers, Europeans experimented with adding new ingredients. The most important of these new ingredients, sugar, was added to counteract the bitter taste of chocolate (Mintz 109). Making the chocolate sweet was thought to make chocolate more appealing to new consumers and contributed to chocolate’s quick rise to popularity in Europe (Mintz 109). Similarly, Europeans began to drink their chocolate hot, rather than cold like the Aztec. This was not new however, as the Maya, before the Aztec, had also taken their chocolate hot (Coe and Coe 115). Lastly, Europeans added spices not found in the New World, such as cinnamon, anise seed, and black pepper. This was not out of pure ingenuity, but rather because New World spices like chili pepper and “ear flower” were not readily accessible in Europe (Coe and Coe 115). In this sense, really the only new innovations Europeans provided were the addition of sugar and the molinillo. Everything else the Europeans introduced, like cinnamon and elegant chocolate containers, were variations on previous New World practices. Regardless of this, all the new ingredients and drinking vessels were included in the concept of hybridization while the molinillo was not. Along with being left out of hybridization, the molinillo was actively disassociated from being a European invention. Often, the Aztec are shown as using the molinillo, which, as discussed, is false. For example, in the scene below from John Ogilby’s America, which displays the Aztec making chocolate, the man second to the right is shown using a molinillo (Coe and Coe 113). Aztec men making chocolate, note the man second to the right is using a molinillo. Similarly, in a drawing from Dufour’s 1685 treatise on coffee, tea, and chocolate, shown below, an Aztec man drinking chocolate mistakenly has a molinillo on the ground below him (Coe and Coe 165). These inaccuracies were likely not intentional and, instead, highlight the European assumption that because the molinillo was also used in the New World it was neither new nor European and, therefore, must have predated European contact with the New World. Aztec man drinking chocolate, note the molinillo on the ground. Europeans had no issue with taking New World chocolate back to Europe to be improved, but were unable to accept the idea that European inventions and practices, like the molinillo, could or would also be utilized in the New World. Instead of considering the molinillo as part of the European hybridization of chocolate, like cinnamon, sugar, and the chocolatiére, the molinillo was incorrectly casted as a pre-Conquest tool incorporated into European innovation. The contrast between the treatment by early historians towards the molinillo and towards other European chocolate technologies signals that hybridization is not simply defined as a chocolate related tool or innovation by Europeans. Instead, hybridization is outlined as a chocolate related tool or innovation made and used exclusively by Europeans. Coe, Sophie D. and Michael D. Coe. 2013. The True History of Chocolate. 3rd edition. London: Thames & Hudson. 157. Through the history of chocolate, there have been many artifacts that have been relevant to the cultivation, harvest, processing, and consumption of cacao, but one of them stands as particularly interesting due to its complexity and specificity: the molinillo. The molinillo is a wooden kitchen utensil used extensively in Mexico and other areas or Latin America, particularly Colombia, as well as in the Philippines. It is formed by a long narrow stick with a thick head on one end, and by several rings that are placed around the main stick and fall next to the head. It is used by placing it between one’s hands and rotating it back and forth, making a rotational motion in the utensil that creates froth in hot chocolate or champurrado drinks. Some molinillos, as the ones shown below, are beautifully ornamented, with colors and carvings that are characteristic of Mexican culture, as well as additional loose parts that help in the frothing of the beverage (Bowman). This is a particularly relevant tool in the history of chocolate because it represents Mexican culture to an extent that other utensils fail to achieve. Before the Spanish arrival to the Americas, cacao was consumed by the Mayans and Aztecs in cold drinks that were unsweetened. Instead of using sugar and cinnamon, the indigenous peoples of the Americas prepared cacao beverages and mixed them with chiles, corn, and vanilla. These drinks were of great importance to the people of these civilizations, but when the Spaniards brought cacao and some of its derivates back to Europe, they got rid of the spices and added milk and sweeteners instead. Suddenly, cacao drinks went from spicy and cold to hot and sweet, and they occupied a privileged place in the tables and kitchens of the European high classes (Mintz). Mexican hot chocolate disk used to prepare champurrado. —champurrado—and the tool that went along with it to assist in its preparation: the molinillo. Although the invention of this utensil is attributed to the Spaniards around the year 1700, it happened on what is currently considered Mexican lands, and it was mostly used by the novohispanos. Molinillo on top of Mexican hot chocolate disk. Its integration to common Mexican culture is such that there are even nursery rhymes that describe the preparation of champurrado with a molinillo, such as “Bate, bate, chocolate,” which is commonly sang by older members of the family to toddlers and young kids in order to celebrate the act of drinking a beverage made with chocolate, and thus cacao (TSL; Fain). During the chorus of the rhyme, children rub their palms together and pretend to be preparing champurrado. This situation makes one reminisce of the original meaning of the Mayan word chokola’j, which literally translates to the verb “to drink chocolate together.” The social component of cacao beverages is enhanced by the specificity of the tools utilized in their preparation, and the particular processes that go into it, such as the turning of a molinillo in a pot to create the characteristic froth of champurrado. A kitchen utensil turned into a nursery rhyme provides the tool with a whole different social dimension of cultural integration and identification, as well as socialization and preservation of traditions. Preparation of champurrado using a molinillo. Bowman, Barbara. “Molinillo – Mexican Chocolate Whisk (Stirrer).” Gourmet Sleuth. N.p., n.d. Web. 16 Feb. 2016. “El Día De Los Niños/El Día De Los Libros.” Texas State Library and Archives Commission. N.p., 20 Feb. 2015. Web. 16 Feb. 2016. Fain, Lisa. “Mexican Hot Chocolate and a Molinillo.” Homesick Texan. N.p., 26 Dec. 2006. Web. 16 Feb. 2016. “Molinillo: Hot Cocoa Frother | Mexico, Wooden Stick, Traditional Hot Chocolate Grinder, Frothing Stick, Molinillos.” RSS. N.p., n.d. Web. 16 Feb. 2016. After eventually being convinced of the many wonderful properties of chocolate, the Spanish quickly set to work adapting chocolate consumption and manufacture to better fit their own cultural traditions. One novel introduction they made in chocolate aeration was the molinillo, pictured below. The molinillo is particularly significant for three reasons: its early design and etymology, its continued use, and its intricate appearance. But before delving into those reasons, it is first necessary to know a bit about chocolate’s history. As all chocolate comes from the cacao pods on a cacao tree, it is best to start there. The cacao tree, or Theobroma cacao, is believed to have originated in the Amazon River Basin (Martin 3). It gradually made its way to Mesoamerica, eventually becoming revered by cultures such as the Olmec, Maya, and Aztecs. These three cultures developed their own techniques for making “chocolate”, which in those days typically meant a frothy liquid drink made from cacao beans. To aerate the drink and produce the frothy texture that was so desirable, some cultures like the Maya poured the drink from one vessel to another. Evidence for this technique is present in pictorial form, such as in the Princeton Vase pictured below. The Princeton Vase is a Maya artifact and according to Michael Coe, “may well be the finest example of Maya pictorial ceramics yet known” (Coe 91). This process of aeration viewed on the Princeton Vase allowed air bubbles to be trapped between the liquid components of the drink and thus produce a lighter and airier drink. Though the Princeton Vase depicts the Maya performing this technique, additional evidence suggests that the Azetcs did something similar, if not identical. While very effective, this technique did not seem appeal to the Spaniards when they arrived. To remedy this, they developed the “molinillo”, essentially a chocolate beater. The molinillo quickly became wildly popular among Spaniards both in Mesoamerica and in Spain. 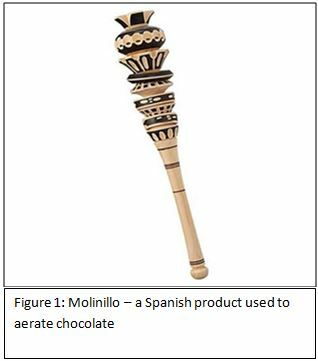 According to Marcy Norton, a professor of history at George Washington university, the “molinillo (chocolate-frother) used to produce the foam became standard in representations of chocolate in seventeenth-century Spain” (Norton 683). As Hernán Cortés firmly established a Spanish presence in the early 1500s, it is clear that the molinillo was rapidly adopted by the Spanish as it was in widespread use about 100 years later. However, while it is evident that the molinillo itself spread so quickly, the reasoning behind the use of the word “molinillo”, which in Spanish means “little molino” or “little mill”, to describe this artifact is not so clear. From the verb “moler”, meaning “to grind” in Spanish, it is possible that the “molinillo” was chosen as a reference to the fact that cacao beans were ground in an early step of the chocolate-making process. In use, the molinillo does not actually grind anything. Instead, it beats and aerates the chocolate mixture. Another possibility is that “molinillo” was a Spanish word adapted to the creation of this artifact. There is some evidence that “molinillo” was used in Spain as early as 1219, well before Spanish invasion of present-day Mexico. Additionally, there are other related Spanish words such as “molinia”, which means to “wiggle or boil something” (Alatorre 24). These similar words indicate that “molinillo” has Spanish origins. Regardless, the word “molinillo” itself ties the two cultures together as firmly as the artifact does because it is a Spanish word used to describe the thoroughly Mesoamerican idea of frothing chocolate. Second, molinillos are still in use today. Growing up in San Diego, I often ventured into Mexico, where molinillos were commonly for sale. Additionally, I had many friends whose parents were born in Mexico and who still ate traditional Mexican cuisine. It was always a treat for me to visit one of their houses and watch as the molinillo was rolled back and forth to create champurrado or some other adaptation of Mexican chocolate. The continued use of molinillos further proves their significance as they are still valued by many families. A quick aside on how to use a molinillo today: The round end of the molinillo is placed in the chocolate concoction while the long slender cylindrical end of the molinillo is held between ones hands. The slender end is twisted between ones fingers so that the entire molinillo spins. The motion made by the hands is similar to that made when trying to warm one’s hands up. 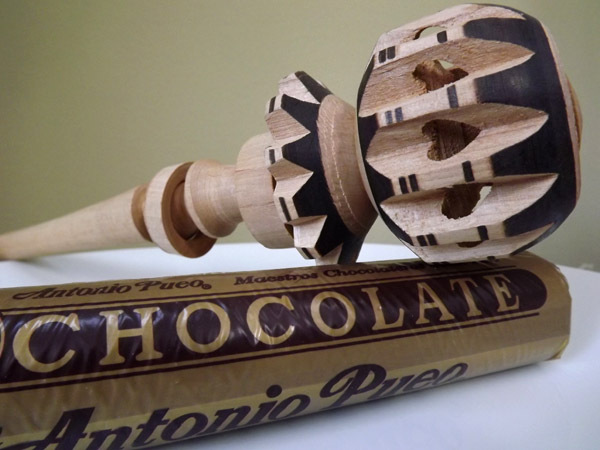 The video below shows a molinillo used to make modern day “Mexican chocolate”. Finally, the molinillo is more than just a tool to aerate chocolate. It is an artistically expressive artifact that is valued by its owners. The process of making a single molinillo is quite lengthy and requires a great deal of skill. Below is a very long video of the process by which a molinillo is made today. Just watch a few minutes! From the video, we see that there are many decorative elements on a finished molinillo. Though not strictly necessary for aeration, they add beauty and weight to the tool. The finished product is almost revered by the owners because it transcends a simple tool. The molinillo’s decoration and the fine craftsmanship needed to produce it elevate it beyond that. All the families that I’ve encountered only own one molinillo each and in every case it holds a special place in the kitchen. Perhaps this is because the molinillo is a reminder of Mexico, the birth country of many of these families. If that is the case, then it could be argued that the molinillo has come to be a symbol of Mexican culture, which itself is a blend of Spanish and Mesoamerican traditions. It is clear that the molinillo has great historical significance. Its early use as a Spanish adaptation of the Mesoamerican aeration technique, its continued importance to Mexican families, and its artistic value all indicate that the molinillo is more than just an artifact – it is a culturally important, functional piece of art. Figure 2. – Kerr, Justin. Rollout View of Princeton Vase. Digital image. Princeton Art Museum, n.d. Web. 20 Feb. 2015. Video 1 – Readandeat’s Channel. “Mexican Chocolate.” YouTube. YouTube, 16 Dec. 2007. Web. 10 Apr. 2013. Web. 20 Feb. 2015. Alatorre, Antonio. “Sobre Americanismos En General Y Mexicanismos En Especial.” Nueva Revista De Filología Hispánica T. 49.1 (2001): 1-51. JSTOR. Web. 20 Feb. 2015. Coe, Michael D. The Maya Scribe and His World. New York: Grolier Club, 1973. Print. Martin, Carla D. “Lecture 3 – Mesoamerica and the “food of the Gods”” AAAS119x Class. Emerson Hall, Cambridge. 4 Feb. 2015. Lecture. Norton, Marcy. “Tasting Empire: Chocolate and the European Internalization of Mesoamerican Aesthetics.” The American Historical Review 111.3 (2006): 660-91. Web. Who does not enjoy a frothed beverage? The molinillo artifact was invented by the Spanish colonists in the 16th century and is often described as a “whisk”, “stirrer”, or “stirring spoon” and was designed to assist in the frothing process for drinks such as hot chocolate and champurrado. Post Spanish conquest in the early 17th century, the Spaniards initial opinions about the Mayans technique to transfer and pour the chocolate mixture back and forth was less than positive as they felt it was a tedious step in the process and uncivilized (Presilla, p.26). The Spaniards took control over chocolate preparation as they eventually saw that wealth and prosperity could be gained from chocolate production and consumption. With time, the Spaniards concluded that the foaming process with a molinillo improved the drinks flavor and temperature. This made the Spaniards happy as they preferred their drinks hot. How did the drink improve with the help of a molinillo? Through the motions required for frothing, the aromas from the mixture are extracted and more pronounced, and the drink increases in temperature, thus making it more desirable. Where does this process occur today? A Starbucks, the Diesel Cafe, and other cafes all over the world, just with a different frothing method; or is it that different? Historically, the first molinillos were simple containing a medium to large sized ball at the base of the stick used for the frothing and a simple wooden handle for stirring. In the 18th and 19th centuries, and more notably after the Spaniards took the chocolate back to Europe, the molinillos changed drastically in color and shape (Coe & Coe, p.118). The ball appeared more colorful, detailed with shapes, and creative. In my opinion, the molinillos changed over time in an effort to try to enhance the frothing process and increase their value for profit. The images below show how molinillos have evolved: the first image is a historic moliniloo that is simple including just the necessary parts, a whisking ball and long handle for secure handling; the second image shows a more modern molinillo that includes additional detail, vibrant colors, and a thicker handle. The molinillo was a crucial artifact during the Mesoamerican era and even into the present day (though much less common). The well thought out tool helped change the way the Spaniards perceived chocolate drinks and contributed to their desire to bring chocolate to Europe so countries like Holland, Italy, Germany, France, and Switzerland could profit from chocolate. Currently, the machine and tools used to froth milk are equally crucial in chocolate drink making as they add pleasure for the drink buyer, the drink is often more costly with frothed milk, and this adds to the overall profit of the drink. Chocolate drinks today like hot chocolate or coffee mochas are made with chocolate and milk, and often include espresso. The milk is the ingredient being frothed and it is done so at different consistencies and in a different way from the molinillo tool. Although molinillos are still used in Mexico and other parts of the world, the greater population now uses steamers to froth. 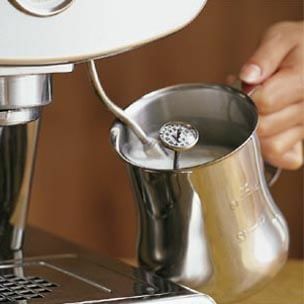 The frothing procedure is typically done with a heated spout that releases hot air pressure and froths the milk into a wet or dry foam, thus adding a superb element to a drink. So, is the process in which Mayans and Aztecs used the molinillo to froth the chocolate mixture that much different from a present day coffee barista using a heated spout to froth milk? I would say no, and would even go further to say that the current benefit of frothing a beverage would never exist without the original molinillo artifact teaching future generations how to perfect a drink by adding froth. The video below shows accurately the process in which milk is frothed in present time. You will notice that the barista taps the container at the end of the steaming process to settle the milk from the foam. This is often done presently to distinguish different drinks like lattes (containing wet milk) from cappuccinos (containing dry foam). The below website will direct you to Rock City Coffee, a cafe and coffee bean roaster in mid-coast Maine producing wonderfully crafted chocolate and coffee drinks, often with delicately frothed milk that takes time to prepare. I worked here many years ago and spent hours learning how to perfectly froth milk. Stop by and enjoy! Presilla, Maricel E. The New Taste of Chocolate: A Cultural and Natural History of Cacao with Recipes. Berkeley: Ten Speed, 2001. 25-27. Print. Coe, Sophie D., and Michael D. Coe. The True History of Chocolate. New York: Thames and Hudson, 1996. 115, 118, 156-157. Print. “A Concise History of Chocolate.” C-Spot. Web. 18 Feb. 2015. <http://www.c-spot.com/atlas/historical-timeline/&gt;. Chocolate has a rich history spanning the cultures of civilizations belonging to both the Old and New World. One would expect nothing less from the divine cacao plant Theobroma cacao, roughly translated as “food of the gods.” The attractive properties were widely recognized globally as the food of the gods’ popularity in Europe was translated from the Olmec, Mayan, and Aztec civilizations thousands of miles away (Coe & Coe 110, Presilla 25 ). This was not a fluke. There is a distinct reason behind the rise of Chocolate’s popularity and its significance in history. Today, chocolate has become one of the most consumed foods in the world. Whether you’re shopping at the mall and pass a Godiva store or buying a box of Crunch at the movie theater, you can clearly see that chocolate has becomes ubiquitous in many countries. In many countries, individuals consume an average of around 10 kilograms every year. The uses of cacao, however, go farther than just the chocolate you see at the grocery counter. Cacao products have a gamut of uses that range from the cacao nibs, which can be used in cooking or eaten like nuts, to the cocoa butter, which is the waxy and fatty substance extracted from chocolate liquor used medicinally as a skincare product. How did chocolate become like this? What led to this high level of popularity? Could it be simply the mass marketing and advertising that surrounds chocolate as a commodity? Or is there something deeper? Shakespeare said, “Some are born great, some achieve greatness, and some have greatness thrust upon them.” History proves that if chocolate were a person, he or she would have belonged to the first group, the group born with greatness. Like many great things usually, Chocolate is shrouded in myths and long painted stories. One of the most widely misunderstood stories associated with the chocolate-dipped junction between the New and Old World is Christopher Columbus’ discovery of chocolate. In fact, when Christopher Columbus first encountered cacao he mistakenly took the plant for almonds. Coe and Coe draw from Columbus’ account of the New World’s obsession with “roots and grains,” specifically the “almonds which in New Spain are used for money” (Coe & Coe 109). Columbus stated that the people of the New World held “hold these almonds at a great price; for when they were brought on board ship together with their goods, [he] observed that when any of these almonds fell, they all stooped to pick it up, as if an eye had fallen” (Coe & Coe 109). This aura that surrounded cacao and chocolate and made it truly special translated between the New and Old Worlds. With the advent of chocolate, Europeans started using chocolate as a platform to meet and discuss important ideas, such as politics. It is during this time that “a cluster of super-elite self-styled ‘chocolate houses’ sprouted and flourished” (Green). Chocolate also served as a path for the New and Old World to engage each other with different ideas and perspectives. The Mesoamerican technique of creating froth by repeatedly pouring chocolate liquid between cups led to the invention of the molinillo (Coe & Coe 115). The molinillo was used as an easier way of creating froth by using rings to invigorate the liquid. Chocolate is more than just a sugary treat. It is a history of the intersection of the Old and New World, a unique way to view the transfer of ideas. From across an ocean, one thing remained the same about chocolate: it stayed divine. Coe, Sophie D. and Michael D. Coe. The True History of Chocolate. London: Thames & Hudson Ltd., 2013. London. Presilla, Maricel E. The New Taste of Chocolate Revised. New York: Ten Speed Press, 2009. Print.